Throughout our time as breeders, we have gained a larger extended family. New, loving homes in which our puppies and older dogs have gone to. Electra, now know as Ellie, is a daughter to our Flirt. She now lives in New Jersey with the Levere family. 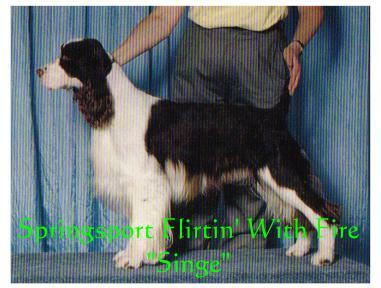 Spatter (now Molly) was my first dog, but found a fantastic home with the Cook family in Fredericton, NB. She has lots of kids to play with, and even a Brittany pal. Singe is out of our large litter of 8. He is brother to all of our current dogs and lives close by with the Carol family.